Sorry to hear you have been without power for so long. I tried to run my fridge off a 1000w (2000w) peak inverter and it was a no go. The sticker inside my fridge said 7.2A @ 120V which is 864 watts. In theory it should have worked, but I guess there is probably some inefficiency within the inverter and the "peak wattage" is good for a second so it's pretty useless for motor/compressor loads that take up to a few seconds when the first power up. Once the compressor is running, the fridge draws less than 200W. I would probably need to try a 1500W or 2000W continuous. When you get into the higher watt range, pure sine gets expensive. I may just stick with modified sine since I would just use it for emergency purposes. I am putting together my plans for doing this right, and I'm trying to decide between a 1500 watt continuous aims pure sine wave and a 2000 watt model. The price difference is considerable, and I wonder if 2000 is just overkill as it is more than a standard 15 amp outlet. I'll have to measure the startup wattage of my furnace to be certain that I still have enough to run a couple LED bulbs off of the other outllet. My plan right now is to install a disconnect switch like people do for generators, so that I can toggle between grid power and my car. The other issue is how to run the extension cords into the house with minimal heat loss. I will consult my electrician friends, but I wonder if I can wire something more permanent so I don't have to rely on a door or window. My impression is that this is sort of a solved problem for folks who often want to use generators to feed things in the house. If money is no object, you can get pretty fancy "transfer switches" automatic an will let you switch individual circuits in your house so that only those are live from your car. You feed the car to your breaker panel, then the house wiring feeds things in the house. So then the issue is just running AC from car to electrical panel. For up to 20A (2000W / 110V would be about 18A), you'll want at least a 10ga extension cord. IIRC, 100ft 12ga cords are good up 15A. It looks like I will need a similar setup. We are having a lot of power issued recently, and I don't mind spending some money to keep the fridge and lights running. However I don't have much experience with this. As far as I could tell, people do not recommend using the lighter port to connect high powered inverters. And the ones I found on Amazon do not come with a compatible plug anyways. Is the proper way to connect these inverters using jumper cables, and bridging the battery to the inverter directly? Or is there another terminal I need to find in the car? WARNING: Be careful! Lots of things can go wrong here. If you're not comfortable with some some basic electrical concepts, 12V inverters, multi-meters, and connecting something to your battery you shouldn't be doing this. Just like an ICE car, the 12V AGM battery is required to start the car. Powering high-power devices from the 12V circuit might run down your battery (either of them) or void your warranty, burn down your house, and scare your dog. What will you be powering? How many watts total? Figure out peak vs continuous. How will you get power to those things? The inverter will be near your car. Make sure extension cords can handle that current needed. Do you need pure-sine wave inverter or something cheaper? Some devices not work without a pure sine wave inverter. I think lights and fridge are probably ok. Again, the RV folks on the Internet know a lot about this. How will you be connecting the inverter to the batter? make sure the wires are thick enough for the current needed into the inverter. I purchased the inverter from Amazon, and got to test it last night. I will have a few more questions since I'm not 100% comfortable yet. I chose that particular device since it had an LCD display including the input voltage. However it came with a 2.5ft ringed connector wire kit, which would not fit the car. To test, I used my jumper cables. They are 10 awg 12 ft, and according to calculators I found online, they would not be safe over 300W or so. There was a separate terminal on the car's body for the black one. As you mentioned, before I started the car, the device measured about 12V input voltage. After turning it on it oscillated between 13.0 to 13.3V. I used a very low power light to test the setup for about 10-15 minutes, then shut it down. These are 5ft at 4 awg. According to https://www.powerstream.com/Wire_Size.htm they should be fine for 100A. Can you confirm? Re wire size: 5ft 4ga would be fine for 100A. When you do it, run it for 30min and see if the wires feel very warm, then you have a problem. I doubt you will though. I don't think any of us know if the e-Golf's DC-DC regulator (the thing that keeps the 12V battery charged, serves the same purpose as an alternator in an ICE car) can handle 100A for an extended period. Other EVs like the Leaf can, but we don't know about the e-Golf. Replacing the ring connectors with alligator clips should be fine. The only thing I would worry about is that some alligator clamps may not make much contact with the terminals on the car. If there is only a few teeth that barely touch the car's terminals, resistance goes up, and you'll end up heating up the clamps and the terminals. Maybe look around for ones with a better shape that gives more contact. You really should have an inline fuse between the battery and the inverter. If possible, I would test this for longer periods of time with more and more load. Alligator clips will not flow enough amperage, you need proper ring terminals soldered on, not crimped. I would not use any clamp on connection for a 1000W load. I would screw the ring terminals on directly. 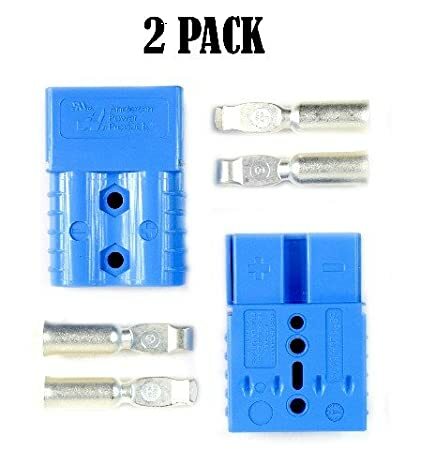 If you plan to use it often, then cut into the cable and put an Anderson Connector in the middle of the cables so you can easily connect and disconnect. Here is a suitable one at Amazon for 4ga cable. You may have seen this kind of connector on larger UPS units. The Power Transmission column in that table is overkill for this application. The calculator at the bottom of the Powerstream site is useful to calculate voltage drop. You will see that 100 amps 12V on 4ga copper will have a 0.255V drop in 5 feet. If you will routinely use the full capacity of that inverter, then you should consider going thicker on the wire. And a .255V drop at 12.7V is how much? Add in how much at the connections also, if the terminals are not minty bright and clean... it's all cumulative. Adding connections creates greater loss. Inverters don't do well with voltage sag, it increases even further the amps they try to draw. 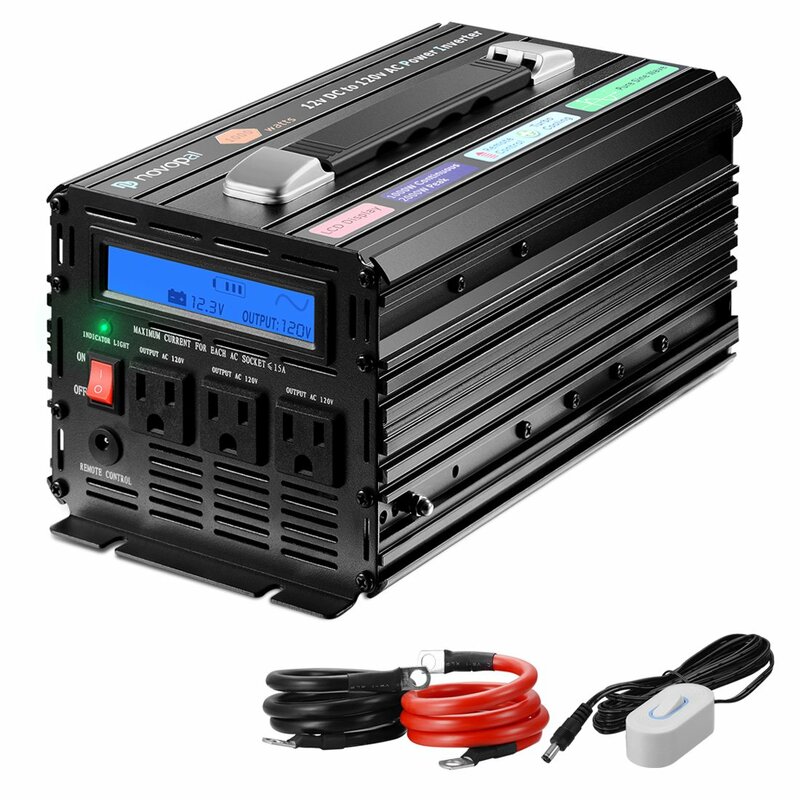 Just saying, it's easy to draw too much from an inverter, ask anyone that runs them in their RV's, Travel Trailers or motor homes. It's more common than you think. I have a 14 foot run from my 50 amp circuit breaker dedicated line to my , NEMA 14-50 50 amp outlet in the garage. Permits were pulled and the electrician pulled 8 ga 90C rated wire. It passed inspection. I didn't like that one of the electrical elbows in the conduit was getting warm while recharging. I pulled the 8 gauge run and replaced all with #6 wire. The hot to the hand 110 to 115F temp at the elbow is gone now. I guess i just tolerate losses less than most people, in my electrical systems, due to heat being generated. YMMV. I'd rather be safe than sorry. A little too much is better than not enough. 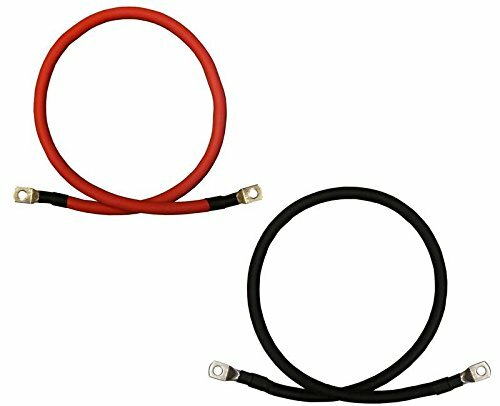 If you want to connect the invrter and car battery, of course you need jump cables which as I know is two battery clips coming with the package. You should be careful to tell the positive terminals and negative terminals. There may be dangers if connected improperly. If you're not experienced, you'd better not do that. The car cigarette lighter DC 12V can output 1--W to 150W power. So, for common device charging, a 100W to 200W power inverter may be enough. Like me, I just have a bestek 200W power inverter for charging cellphones, tables. If you want to charge larger devices with over 150W, you need to use the cables.